Those of you who are in Mangalore at the moment (residing or holidaying there) must be having at least a wedding or two to attend. The wedding season in Mangalore has officially begun today (post Christmas). This is of course followed by those who religiously observe Advent (the season prior to Christmas in preparation of the birth of Christ) the period during which the Church did not conduct weddings till a few years ago. However, in today’s time & age when weddings are planned and prepared months in advance, in view of the ‘rush’ during the season, bookings are made as quickly as possible. Owing to everyone’s convenience (guests who travel from overseas especially), weddings are held during the advent season too. Anyway, in today’s post I want to throw some light on our Mangalorean Catholic weddings and the fun and food that are such an integral part of it. While I want to write a million things about our weddings, the irony is that I dreaded the weddings when I lived in Mangalore. Now I sorely miss them and would jump at the first opportunity of attending one – no matter how remotely that person is related (or not!) to me! Irrespective of the fact that our Catholic weddings can be such a big bore if you don’t know anyone in the crowd or know too many people that you are actually trying to dodge those aunties who ask you a million personal questions – when, when & when – any question they ask you usually begins with ‘when’. When are you finishing college? When are you getting married? When are you going to have a baby? I am sure all of you have dealt with at least one such annoying jobless auntie. Mangalorean Catholic weddings are preceded by a pre-wedding function called as the ‘Roce’ ceremony. ‘Roce’ in Konkani refers to the coconut extract – or coconut milk which is supposed to have cleansing properties apart from plenty of cosmetic benefits. Traditionally the bride and groom are ‘cleansed’ and ‘prepared’ for the life that follows the marriage ceremony. Basically it is a custom borrowed from the local Hindu cleansing rituals and can be compared to the ‘haldi’ ceremony that is followed elsewhere in India. The Roce ceremony is the most fun among the two ceremonies as the gathering is smaller consisting only the close family, neighbours and friends of the bride or the groom. Besides a lot of song and dance that is customary, the food served on the day of the Roce is also traditional – at least one of the items is – the Mutton Polov. 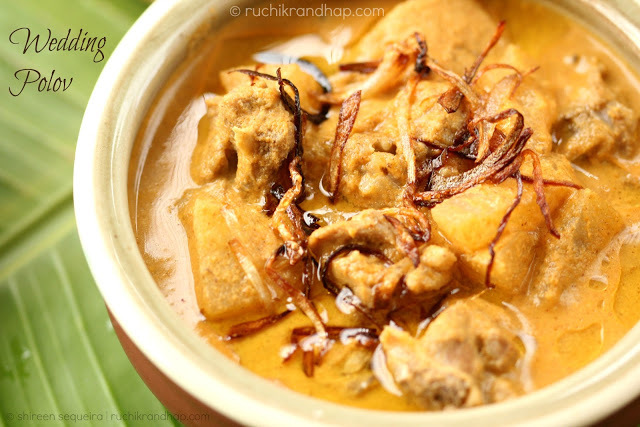 Its a typical stew made out of roasted & ground spices, roasted coconut, mutton and ash pumpkin (winter melon). The earliest Polov preparations were made only with the ash pumpkin (called as kualo in Konkani), some people would add shrimp to it – it was all about the affordability of the host. As the decades passed by Polov and Mutton became constant companions. A traditional ‘Roce’ meal was served on banana leaves – it included mutton polov served with a large bun made in large ovens fueled by fire wood. Guests were also served traditional kele sukhe (plaintain (raw banana) sukka (side dish made of aromatic spices and roasted coconut) and fodi che lonche (chunky mango pickle). and unpolished (brown) rice of course. Again, the number of meats served to guests depended on how wealthy the host was, so sometimes guests would get to enjoy pork sorpotel (a delicacy made out of pork offal). I have tried to recreate the ‘roce’ meal (minus the pork sorpotel) below. The bun was made in my own kitchen, so it’s not as big as what is served during the Roce. I have posted an easier mutton polov recipe which is made with stew powder, however this recipe is the more traditional way of making it. 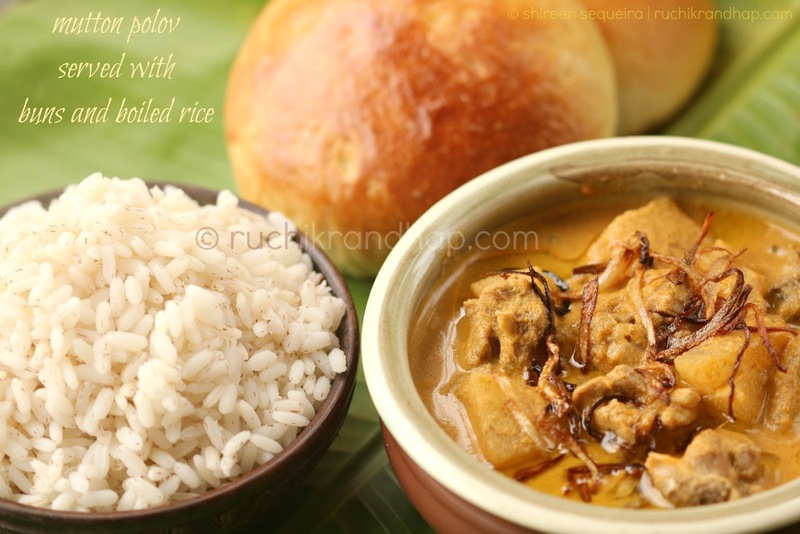 If you are invited to a Roce function in Mangalore, I really hope you get to eat the mutton polov and bun – it truly is the essence of the lovely ceremony. 1. Cut the mutton into small pieces, wash and drain. Pressure cook it with a little salt & keep aside. Remove the skin & pith (seeds) of the ash pumpkin and cut into cubes.Boil the ash pumpkin with a little salt and 1 cup of water (or enough to cover it) till tender (do not overcook). 2. In a heavy bottomed pan or skillet/tawa roast the coconut & sliced onion (‘Korpo’) on a very slow flame till the colour changes to light brown (biscuit colour) – this may take 15-18 minutes. Ensure not to burn the coconut. Remove and allow to cool. Next, on the same pan/tawa roast all the ingredients mentioned under ‘For the masala’ – except the coconut & tamarind – one by one till you get a nice aroma. 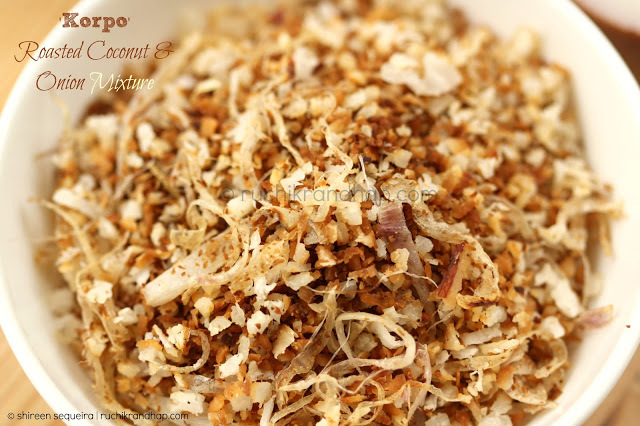 Allow them to cool a bit and grind them to a fine powder, then add the unroasted coconut, tamarind and the ‘korpo’ along with a little water to achieve a fine paste. Reserve the masala water from the grinder. 3. Add the ground masala to the pre-cooked ash pumpkin, add the cooked mutton and its stock (cooking liquor) adjust salt to taste and bring the curry to a boil for a couple of minutes. Add the reserved masala water and additional water if required to adjust the consistency of the gravy. The gravy should be neither too thick nor too thin. After adding the water, continue to simmer for 3-5mins & turn off the flame. 4. In a smaller pan heat the ghee for seasoning and when hot, toss in the sliced onions and fry till golden brown. Add this to the curry and cover the pan immediately. 5. Serve hot with a plain bun or traditional red/brown rice. am truly drooling over the meal served on banana leaf. never tried anything like this but so tempted…it spells delicious. Can i get that meal, love it..Been ages i had foods served on banana leaf. My husband loves growing certain veggies and this season we got a 20 lb kuwalo! If there was a way to share a pic, I would :o). I was looking for a mutton kuwalo polou recipe online, and I'm so glad I stumbled upon your website. I tried this recipe and it was just perfect. Thank you for the ease of following this recipe from your simple explanations and measurements provided. The pictures/ presentation is lovely. I know I will be regularly checking for recipes henceforth. Please share I love to see vegetables grown at home. 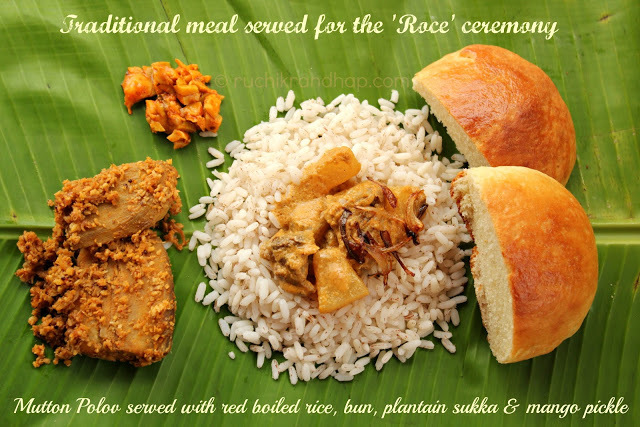 Missed the wedding season in mangalore this time so thought of making a traditional roce meal at home. And guess where i found the recipes of polov and kele sukhe;) also with nice history about the dishes. Thanks a million. @ Darryl: Thanks so much for your lovely comment! 🙂 Do stay tuned for more traditional recipes! Happy New Year to you and yours!! Thank you so much for your lovely words of appreciation Leeza!! I am so glad that my blog is helping you! I am a regular visitor to this your page especially when craving for Managalorean food. I am planning on an all Managalorean feast for Christmas this year and I like to plan in advance. I would love to make Mutton Polov to serve with Pan Pole but where I live in Australia we do not get Ash Pumkim, is there a substitute to this without changing the taste too much. I though of simple potatoes but would appreciate your advice. My apologies for the delay in responding. Well, you won’t get the same taste without the ash pumpkin but you could use bottle gourd or Mangalore cucumber (mogem) instead. Potatoes will do too! Thanks Shireen, we do get bottle gaurd will try with that. Sure! Do let me know how it turned out!